Statue of Turing by Stephen Kettle at Bletchley Park, commissioned by Sidney Frank, built from half a million pieces of Welsh slate. Following his work at Bell Labs in the U.S., Turing pursued the idea of electronic enciphering of speech in the telephone system. 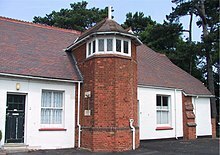 In the latter part of the war, he moved in order to work for the Secret Service's Radio Security Service (later HMGCC) at Hanslope Park. At the park, he further developed his knowledge of electronics with the assistance of engineer Donald Bayley. Together they undertook the design and construction of a portable secure voice communications machine codenamed Delilah. The machine was intended for different applications, but it lacked the capability for use with long-distance radio transmissions. In any case, Delilah was completed too late to be used during the war. Though the system worked fully, with Turing demonstrating it to officials by encrypting and decrypting a recording of a Winston Churchill speech, Delilah was not adopted for use. Turing also consulted with Bell Labs on the development of SIGSALY, a secure voice system that was used in the later years of the war. In 1948, Turing was appointed reader in the Mathematics Department at the Victoria University of Manchester. A year later, he became Deputy Director of the Computing Machine Laboratory, where he worked on software for one of the earliest stored-program computers—the Manchester Mark 1. 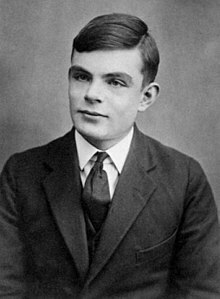 During this time, he continued to do more abstract work in mathematics, and in "Computing Machinery and Intelligence" (Mind, October 1950), Turing addressed the problem of artificial intelligence, and proposed an experiment that became known as the Turing test, an attempt to define a standard for a machine to be called "intelligent". The idea was that a computer could be said to "think" if a human interrogator could not tell it apart, through conversation, from a human being. In the paper, Turing suggested that rather than building a program to simulate the adult mind, it would be better rather to produce a simpler one to simulate a child's mind and then to subject it to a course of education. A reversed form of the Turing test is widely used on the Internet; the CAPTCHA test is intended to determine whether the user is a human or a computer. ↑ Grattan-Guinness, Ivor, Chapter 40, Turing's mentor, Max Newman. In Copeland, B. Jack; Bowen, Jonathan P.; Wilson, Robin; Sprevak, Mark (2017). The Turing Guide. Oxford University Press. ISBN 978-0-19-874782-6. 1 2 3 4 Newman, M.H.A. (1955). 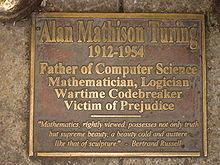 "Alan Mathison Turing. 1912–1954" (PDF). Biographical Memoirs of Fellows of the Royal Society. 1: 253–263. doi:10.1098/rsbm.1955.0019. JSTOR 769256. ↑ Phil Maguire, "An Irishman's Diary", p. 5. The Irish Times, 23 June 2012. 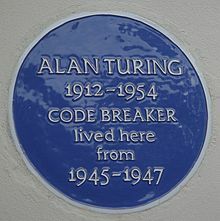 ↑ "Blue plaque to commemorate Alan Turing". King's College, Cambridge. Retrieved 8 December 2018. 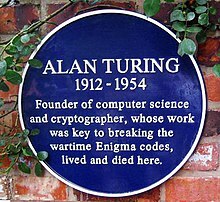 ↑ "Turing plaque fixed in place". King's College, Cambridge. Retrieved 8 December 2018. ↑ Turing, A.M. (1939). "Systems of Logic Based on Ordinals". Proceedings of the London Mathematical Society. s2-45: 161–228. doi:10.1112/plms/s2-45.1.161. ↑ Turing, A.M. (1938). "Systems of Logic Based on Ordinals" (PDF). 1 2 "This month in history: Alan Turing and the Enigma code". www.thegazette.co.uk. Retrieved 6 February 2019. ↑ Turing, Alan M. (2001). "Visit to National Cash Register Corporation of Dayton, Ohio". Cryptologia. 25 (1): 1–10. doi:10.1080/0161-110191889734. ↑ Randell, Brian (1980). 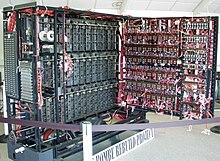 "A History of Computing in the Twentieth Century: Colossus" (PDF). Retrieved 27 January 2012. citing Womersley, J.R. (13 February 1946). "'ACE' Machine Project". Executive Committee, National Physical Laboratory, Teddington, Middlesex. 1 2 Turing, A.M. (1948). "Rounding-Off Errors in Matrix Processes". The Quarterly Journal of Mechanics and Applied Mathematics. 1: 287–308. doi:10.1093/qjmam/1.1.287. ↑ O'Connor, J.J.; Robertson, E.F. "David Gawen Champernowne". MacTutor History of Mathematics archive, School of Mathematics and Statistics, University of St Andrews, Scotland. Retrieved 22 May 2018. ↑ Sheth, R.; Marcon, L.; Bastida, M.F. ; Junco, M.; Quintana, L.; Dahn, R.; Kmita, M.; Sharpe, J.; Ros, M.A. (2012). "Hox Genes Regulate Digit Patterning by Controlling the Wavelength of a Turing-Type Mechanism". Science. 338 (6113): 1476–1480. Bibcode:2012Sci...338.1476S. doi:10.1126/science.1226804. PMC 4486416. PMID 23239739. ↑ Hodges, Andrew (2012). Alan Turing: The Enigma. p. 463. ISBN 0-691-15564-X. ↑ Hodges, Andrew (2012). Alan Turing: The Enigma. p. 471. ISBN 0-691-15564-X. ↑ Hodges, Andrew (2012). Alan Turing: The Enigma. p. xxviii. ISBN 0-691-15564-X. 1 2 3 Hodges, Andrew (2012). Alan Turing: The Enigma. Random House. ISBN 1-4481-3781-0. ↑ "TURING, Ethel Sara (1881-1976, mother of Alan Turing). Series of 11 autograph letters to Robin Gandy, Guilford, 28 July 1954 - 11 June 1971 (most before 1959), altogether 29 pages, 8vo (2 letters dated 17 May and 26 May 1955 incomplete, lacking continuation leaves, occasional light soiling)". www.christies.com. Retrieved 6 February 2019. ↑ Levy, Joel (2018). Mathematics: A curious history - From Early Number Concepts To The Chaos Theory. London: Andre Deutsch. p. 177. ISBN 9780233005447. ↑ Turing, A. M. (1950). "Computing Machinery and Intelligence" (PDF). Mind (59): 433. ↑ John Horgan (20 July 2012). "Brilliant Scientists Are Open-Minded about Paranormal Stuff, So Why Not You?". scientificamerican.com. ↑ Vincent Dowd (6 June 2014). "What was Alan Turing really like?". bbc.co.uk. ↑ Britton, Paul (2013-12-24). "Alan Turing pardoned by The Queen for his 'unjust and discriminatory' conviction for homosexuality". Manchester Evening News. Retrieved 2018-06-24. ↑ Participation, Expert. "Policing and Crime Act 2017". www.legislation.gov.uk. Retrieved 6 February 2019. ↑ "Academic facilities". King's College Cambridge. Retrieved 12 May 2014. ↑ DELPECH, Sabine. "Université Toulouse III - Paul Sabatier - Campus". www.univ-tlse3.fr. Retrieved 6 February 2019. ↑ "BBC Two - Icons: The Greatest Person of the 20th Century". BBC. Retrieved 6 February 2019. ↑ "Turing Test", BBC, 24 October 2014. ↑ Sheppard, Justin (7 September 2006). "Track Review: Matmos – Enigma Machine For Alan Turing". Prefix Mag. Retrieved 5 February 2015. ↑ "The Imitation Game (2014) - Box Office Mojo". www.boxofficemojo.com. Retrieved 2018-12-27. ↑ "How The Weinstein Co. Turned 'Imitation Game' Director Into an Oscar Contender". The Hollywood Reporter. Retrieved 2018-12-27. Ceruzzi, Paul E. (1998). A History of Modern Computing. Cambridge, Massachusetts, and London: MIT Press. ISBN 0-262-53169-0. Lewin, Ronald (1978). Ultra Goes to War: The Secret Story. Classic Military History (Classic Penguin ed.). London: Hutchinson & Co (published 2001). ISBN 978-1-56649-231-7. Mahon, A.P. (1945). "The History of Hut Eight 1939–1945". UK National Archives Reference HW 25/2. Retrieved 10 December 2009. Oakley, Brian, ed. (2006). The Bletchley Park War Diaries: July 1939 – August 1945 (2.6 ed.). Wynne Press. Turing, A.M. (1937) [Delivered to the Society November 1936]. "On Computable Numbers, with an Application to the Entscheidungsproblem" (PDF). Proceedings of the London Mathematical Society. 2. 42. pp. 230–65. doi:10.1112/plms/s2-42.1.230. and Turing, A.M. (1938). "On Computable Numbers, with an Application to the Entscheidungsproblem: A correction". Proceedings of the London Mathematical Society. 2. 43 (published 1937). pp. 544–46. doi:10.1112/plms/s2-43.6.544.